Thank you for joining me as we count down to the MFT release. We are just one day away from the big day! All the new Stamps, Die-namics, and Stencils will be available on Tuesday, June 5 at 9:00 pm EST. Be sure to check out the MFT Blog to see all the new items being revealed today. Don't forget to leave a comment on the MFT Blog countdown posts, YOU could win one of the five $75.00 gift vouchers. The new Stitched Blooms Die-namics are sure to be a favorite die on my stamp desk. I can see myself reaching for them over and over again. 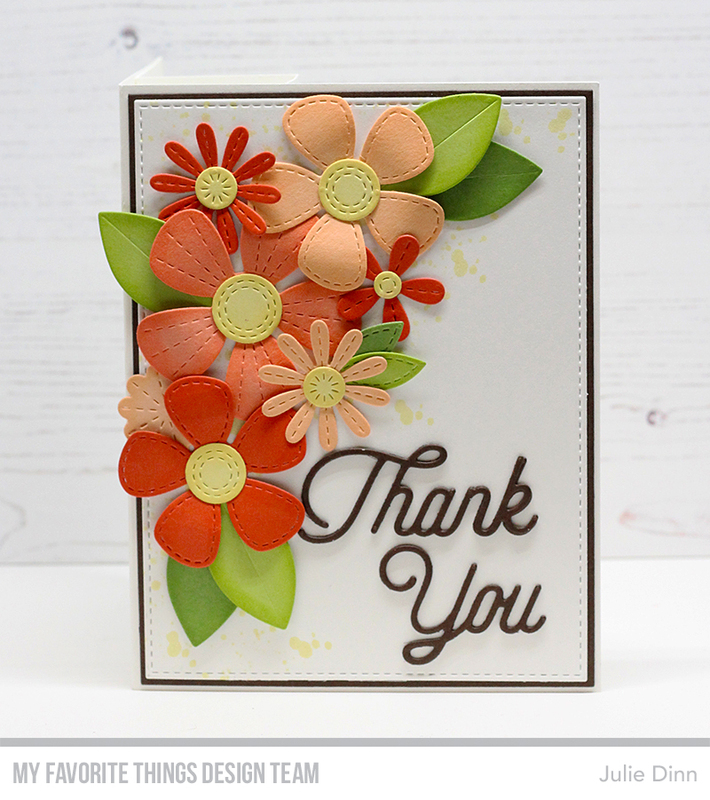 For this card, I went for a peach and coral color combination with bright green leaves. The sentiment, is one of our older dies, Twice the Thanks. The inside of the card has a cool book-style fold. I stamped the background with the Distressed Patterns and Lemon Chiffon premium Dye Ink. The sentiment is from the Kind Thanks stamp set. I love the summery colors of your card! It’s lovely. This is amazing! I love the colors! I would never have thought to put that combo together! Beautiful! Very pretty colors & I love the stitching on the flowers. Great card!!! Gorgeous colors! Very cool card! !